Samsung's Gear Fit had every chance to be by far the best activity tracker you could own. It isn't. Not by a long shot. And there's nothing sadder than unrealized potential. It's a stunning fitness tracker slash smartwatch wristable. It counts steps, tracks sleep, displays notifications from your phone, and even takes your pulse. It only works with Samsung devices. Yes, you're basically not allowed to be a tech company if you don't make a wearable device these days. But the Gear Fit is by far the best-looking entrant in an increasingly crowded field. It also promises the best of both fitness tracking and smartwatch worlds. What could possibly go wrong? It's lovely to ogle. Front and center, the Gear Fit features a 1.84-inch, curved, full-color AMOLED touch display. It's got the same inky dark blacks and those vibrant colors we love in devices like the Galaxy S5. It's encircled by a shiny chrome bezel, a familiar Samsung note. There's a single button that you use to wake up the screen, go back to the home screen, or turn the Gear Fit off. Simple! The band itself is your standard hard rubber affair, available in six different colors. It's nicely contoured, and one of the most comfortable wrist-worn trackers I've used. It has a simple poke-two-pegs-through-two-holes clasp system (reminiscent of Fitbit) and surprisingly I never had an issue with it popping off. It's a really sleek, low-profile device. It's unobtrusive, but if someone does notice it, it'll get compliments instead of groans. On the underside of the device is a sensor that lets the Fit read your heart rate, much like a pulse oximeter. It also has an IP67 rating which means it can handle being submerged in three feet of water for up to 30 minutes. In other words, you can shower with it or wear it in the rain, but you probably don't want to swim with it (or no diving, at the very least). It uses Bluetooth 4.0 LE to communicate with Samsung Android phones. On paper, the Gear Fit seems fantastic. It counts your steps, it reliably displays any notification from any app you want (and not from apps you don't) from your Samsung Android phone, and it can track your exercise in tandem with the S Health app on your phone to give you even more data. It would be the perfect little package, if it actually did all three of those things halfway decently. In fairness, the Gear Fit works just fine as a second screen displaying your phone's notifications. It's legitimately convenient to be able to take a quick glance at your watch, see that it's not an email you need to deal with, and get back to whatever it was you're doing. I set it up to receive notifications from Gmail, Google Voice, Hangouts, Calendar, Twitter, and Facebook. When one pops up you click on it, and it displays the first couple lines of text. If you want to read more, you hit the "Show on device" button, and it'll open that app, though not usually that specific message. The fact that it works seamlessly with the notification panel is a marked improvement over last year's Galaxy Gear—and about on par with what you'll find on the Gear 2—but the Gear Fit's unique shape makes actually reading those notifications can be an exercise in frustration. That long, skinny screen running perpendicular to your arm bone is actually a pain in the neck to read. Literally. If you keep it in its standard orientation (i.e. it appears right-side up when your fingers are pointed upwards) then you have to squish your elbows in, crick your neck, and make little T-rex arms to see the screen. Flipping the screen so that it looks right-side up when your fingers are pointed toward your chest is very slightly better, but it's still not comfortable. To its credit, Samsung adapted to this feedback very quickly and created a vertical orientation mode. That's your best bet for most situations in terms of physical comfort, but you're left with text that gets oddly split when you're reading through notifications. And that's what actually works. The rest? Not so much. The step-counter is wildly inaccurate. I went for a walk, carefully counting 500 steps. The Fit told me I'd walked 700. That's far enough off to be effectively useless. You also have to manually start the pedometer, which you don't have to do for any other fitness tracker. It gets worse. The S Health app on your accompanying Galaxy device—you need one of those, remember—has a built-in pedometer, too. Great, so they talk to each other, right? Theoretically. But in reality, nope! It doesn't matter if you set it to sync at the most frequent option (every 3 hours) or if you do it manually—the Fit always thinks you walked way more than the Galaxy S5, and they will not come to an agreement. This whole "two things that were absolutely designed to be used together but don't really talk to each other" dynamic is even more stark if you go for a run. Ideally, the Fit would act as a second screen for S Health's now more-robust (but still way behind standard bearers like Runkeeper) running app, feeding in data and displaying the info you want to know, like heart rate and cadence. But nope! 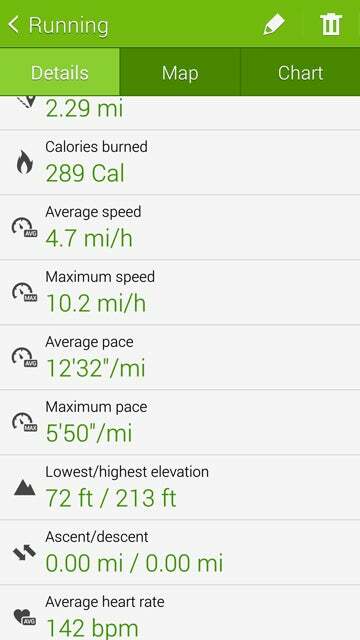 The running mode on the Fit and on the Galaxy S5's S Health app work completely separately. You will have two different digital coaches telling you to do two different things simultaneously. And when you're done, you'll have two separate reports for your run, both with wildly different data, and both with important fields missing all together. You can see an example of the discrepancies above. Then comes the sleep tracker, which you have to manually start and stop (not the end of the world, but easy to forget, and not a requirement of competitors like the Basis Band). The real problem: That data doesn't go anywhere! You can't even view it in the S Health app. The Gear Fit tracks it, displays it once you've woken up, and then it's gone aside from a weekly "sleep history" bar chart that's effectively useless. The Gear Fit's also not smart enough to know that you probably don't want notifications on while you're in sleep mode. You can't turn them off on the watch, or simply mute them. Instead, you have to go into the Gear Fit Manager app on your phone and disable notifications altogether, every night, and enable them again every morning. In brief: The software on the Gear Fit is so completely, fundamentally broken, that it takes the most promising piece of hardware we've yet seen in the wearable space and makes it pretty darn useless. And even the hardware has its share of irritating quirks. The display is beautiful, but because there's no ambient light sensor it seems to always be too bright or too dark. If you leave the wake-up gesture on (the "checking your watch" gesture) you will wake yourself up with a blast of light every time you roll over in your sleep. On the plus side, I got a solid four days of usage on a single charge, and it survived multiple showers. The hardware is near-perfect. Really, all it's missing is an ambient light sensor, and maybe a mic for quick replies to email. But the screen is lovely, the band is comfortable, and the whole thing just looks great. Four days of battery life is totally respectable, as is its water resistance. Also, seeing a brief summary of emails, texts, @replies, and Facebook message as they come in is legitimately convenient and helped me stay on task and out of the attention vortex that is my phone. It's nice to be able to control your music player from your wrist. The software is unforgivably bad. Tragically bad. It feels as if the Gear Fit and the S Health teams barely spoke to each other at all. Which is especially bedeviling since Samsung made the conscious choice to sell a wearable product that only works with Samsung products. At least when Apple locks you into an ecosystem, things actually (mostly) work. The Gear Fit's pedometer is inaccurate, the exercise app doesn't really integrate with S Health, and the sleep data doesn't go anywhere at all. If you're outside you need to turn the screen up to full brightness, but it will only stay in that mode for five minutes before reverting to medium brightness. Incredibly frustrating if you're going for a run that lasts more than five minutes. Touchscreen controls tend to be very unresponsive, too.